Since 1983 Pro Dive Cairns has developed and maintained an international reputation as the premier dive company in Cairns. Their modern purpose built diver training centre provides some of the best facilities available. They have 16 spectacular dive sites over 4 different reefs and provide one of the best outer reef liveaboard experiences from Cairns. This company is committed to the idea that, regardless of level, any diving activity taken with Pro Dive should be safe and enjoyable. The first 2 days of your 5 day course are spent learning the theory and underwater skills of diving. Days 3, 4 & 5 are spent onboard one of Pro Dive's 3 fully equipped, purpose built multi-million dollar dive vessels. The vessels carry only 32 passengers and the itinerary allows for a total of up to 9 dives in total - the first 4 dives are your training dives, which are followed by 5 pleasure dives (weather permitting). Cabins onboard are ALL TWIN SHARE (2 x single bunk beds) or DOUBLE (1 x double bed). Courses commence 6 times per week and can be done in English, German or Japanese. You will find that this is one of the more expensive courses out from Cairns however this is because they incorporate all costs in the one price - there are no hidden extras. We do strongly recommend that you pre-book this course as it is one of the most popular learn to dive options. Another added bonus is that the course is fully refundable up until the end of the first day of the course. This means that you have right up until the end of the first day to cancel for any reason - which is very reassuring. Please Note: Pick up times will vary depending on accommodation location. Please bring your swim wear, towel, cash for lunch and dive medical (if required) - Some medical conditions may prevent you from diving. You will be required to obtain a dive medical certificate prior to starting the course if you answer 'yes' to any of the questions on the medical declaration, this must be valid within 90 days of starting the course. 10:30 The last Training Dive for your PADI Open Water Certification Course. Now You are a Certified Diver!!! 19:00 A guided night dive after dinner. Another great experience! All stationary requirements needed for classroom activities. 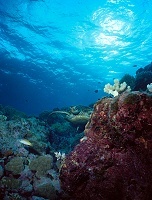 Enquire about our Cairns Ultimate Learn to Dive Package. Package includes 4 nights accommodation and prices start from $1140 per person twin share. To make a secure booking click on the "Book Now" link below to be transferred to the Pro Dive Cairns secure booking system.